Last week I got hit by a triple load of releases. One anthology appearance had been scheduled for months, but the other two caught me by surprise. I knew they were coming, but I didn’t know when. As mentioned here before, my story “When the Trains Run on Time” is in Playground of Lost Toys. Edited by Colleen Anderson and Ursula Pflug, this is book eleven of Exile’s anthology series. I was already in book ten, New Canadian Noir, earlier this year, so that’s a double-header from Exile Editions. 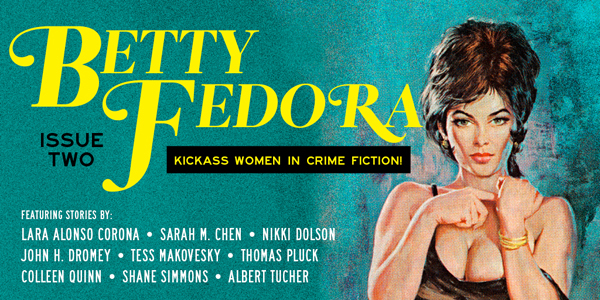 Speaking of my criminal enterprises, we have Betty Fedora Issue Two: Kickass Women in Crime Fiction, edited by Kristen Valentine of (you guessed it) Betty Fedora. “Heads Will Roll” is the lead story. As such, you can read most of it for free by checking out the Kindle preview on Amazon. But to make it all the way to the punchline, you’ll have to shell out for a copy. An e-copy of the whole book will run you a buck. If you want to read some of my genre work and you’re too cheap to shell out as little as 99 cents, “Black Ink” is available for free from Out of the Gutter Online. It’s the shortest of the three new stories and probably the nastiest, if that’s what turns your thumbscrews. More stories are on the way, as listed on eyestrain’s anthologies page. At this late day, I figure I’m probably done for 2015. But starting almost immediately in 2016, “The Last Seven Miles and Home” has just been slated to appear in Bumps in the Road from Black Bed Sheet Books. “Bayonet Baby” gets another kick at the can in Illuminati at My Door in March. And there’s another major piece I’m not allowed to mention yet, but I look forward to adding that intriguing cover to the website once I get the go-ahead. Since I’m on a roll with new material, I figured it was time to link to some of my old material on the articles page. These two entries were essays I wrote semi-anonymously online, but they’re still drawing eyes from time to time, so I thought I should finally cop to being the author. “Tourist Fakes: The Quest” is an epic saga I wrote about a trip to the Mediterranean five years ago and my attempts to be willingly conned by scam artists. Is a con still a con if it’s consensual? Decide for yourself as you peruse parts 1, 2, 3, 4 and 5. “Whatever Happened to Mr. Pink” dates back twenty-two years and is still chugging along. Written before the web was a thing, when most people (myself included) didn’t even have their own email address, this film-nerd dissection of a controversial scene in a (then) fairly obscure cult movie by some writer/director newbie has been cut and pasted by others many times, cropping up on numerous websites once that web thing finally got popular and took off. That does it for now. Sometime in the near future, I promise to write something entertaining on the blog that isn’t shameless self-promotion.